On the Welcome to Stripe screen, click on Go straight to your dashboard. In the upper left hand corner, turn it from Test to Live. That's it! Now you can configure PeopleVine. 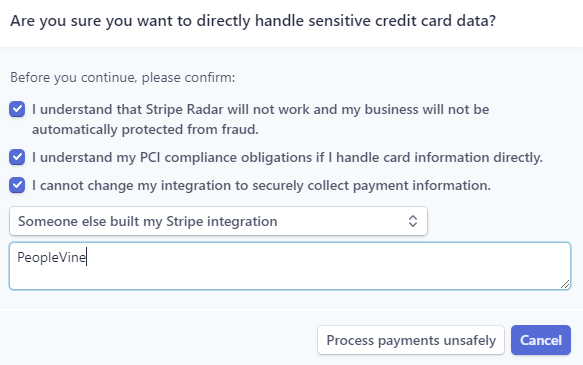 Now that you have setup your account with Stripe, you can follow these steps to integrate it into your PeopleVine account. For more information about payment processors supported by PeopleVine, please view this article. On the dashboard, click "API" (on the left). Copy the "LIVE Secret Key" (case sensitive, ensure no extra characters or spaces are brought over). - See step 5 below on where to paste in PeopleVine. Copy the "LIVE Publishable Key" (case sensitive, ensure no extra characters or spaces are brought over). - See step 5 below on where to paste in PeopleVine. If you are testing, copy the Test Secret Key values. If you are ready for production, copy the Live Secret Key values. Please note that if you refresh your keys, you need to also update in PeopleVine too. Under "Then, when should a payment be blocked?" uncheck "Block if CVC verification fails"
If you are not using recurring billing/subscriptions, then we recommend you leave this checked. 4. Check Process payments unsafely and then check off that you confirm each of the other options. 5. Refresh the page and you will see the option is enabled. The PeopleVine platform is PCI Compliant and is audited on a regular basis. Because of that, we don't need to rely on Stripe for this and leverage payments via their API for more flexibility. If you have an issue with confirming these changes, please check our other integrated payment providers. You can now accept payments through PeopleVine via Stripe.